A little more on the HBA installation in Chilbolton (which was finished last week). 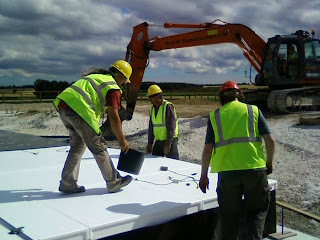 This one about the tricky details of using the digger to install the tiles at the edge of the field. It is at the edge of the field that the use of the tracked digger becomes critical. The LOFAR Chilbolton site is on a slope, which means that to level the field, one needs to cut into the ground at the high end. That in turn leaves a bit of a steep slope to deal with. In the image, Stuart Keenan, Zabet Ahmadi and Matthew Hambley complete the fitting of a tile by the field edge. John Murray backs up the digger to the higher ground behind the tile.